Application: With 80 Wrestling and 80 Anatomy you can attempt to stun your opponent. The chance to succeed with the stun depends on your ability with these two skills. Application is manually triggered by a hotkey setup in your UO client options. Activation: In the UO Client hit alt-O to bring up the options screen. Go to the macros tab and make a new macro. Once you pick a key assignment scroll down to [SecondaryAbility]. When you want to stun someone toggle the ability using this hotkey. Every wrestling attempt while this is active will attempt to stun the target. Each attempt will cost 15 stamina. 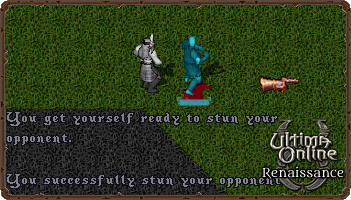 Active state: You get yourself ready to stun your opponent. Inactive state: You decide to not try to stun anyone. Effect on target: Target is stunned for a 4 second duration.